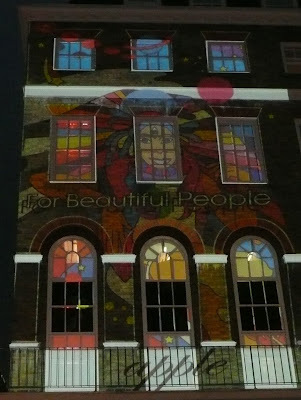 At 9.16pm, the building at 94 Baker Street, the former home to the Apple Boutique, was illuminated with a mural including the words “Another Beautiful Place for Beautiful People”. Unlike the mural from the '60s painted by “The Fool” which local residents petitioned for removal , the latest multi coloured mural drew some cheers and applause as it lit up the area. Eventually The Beatles had to have the original removed and the building was just painted white, but this one was just for 1 night only, so I don’t think the locals minded this time around. People walked by wondering why a crowd of people had gathered, without realising the significance of it all. The original invites sent out by The Beatles for their launch of the boutique in 1967 invited guests to arrive at 8.16pm. However, it was felt that 9.16 would be a better time to view the work, as it would be darker at that time. The event was organised by the current owners of the building. The upper floors above the shop have been converted into luxury flats, and one could be yours for a mere £1.5 million. Guests at the event included Trembling Wilbury Dave Stark, George lookalike Glen Knowler, a John and Yoko lookalike plus our very own Richard Porter, Michele Copp and Terry Bloxham. Jeni Crowley also attended. Jeni worked for the original fan club in the 1960’s and actually worked in the Apple building that was in front of us. Jeni shared a few stories with us, including how she got to see the recording session of “I Am The Walrus”. The BBFC hope to interview Jeni in the future, so watch out for her fascinating memories. Great article, thank you for share it. You´re the best.